Did you know that Jesus had more to say about money than He did heaven or hell? So many of His parables and illustrations dealt with money. Why is that? Because most people have trouble with money ... either loving it, longing for it, hoarding it, misusing it, or trusting to much in it. Money is a great servant, but a terrible master. 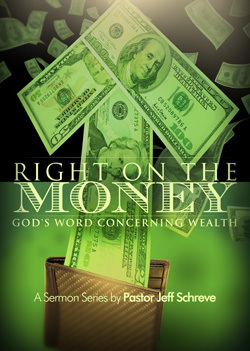 In this 5-MESSAGE series from Pastor Jeff Schreve, you'll learn how to manage your money in a way that will please God and prosper you!